Amidst these exciting times of the TPP agreement, Keidanren (the Japan Business Federation), an influential economic organization that fosters U.S.-Japanese business cooperation, reopened its office in D.C. During the 2009 financial crisis they had unfortunately been forced to close their D.C. branch. 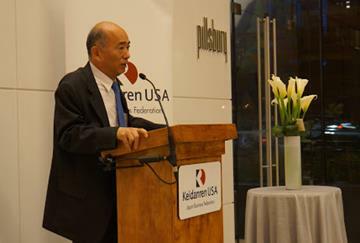 An opening ceremony and reception commemorating Keidanren’s return to DC was held on Wednesday, November 4. At the reception, Mr. Atsushi Yamakoshi, head of Keidanren’s office in D.C., stated that he was confident that their new office could become a platform for the promotion of Japanese business accomplishments and their contributions to the U.S. economy, and for furthering U.S.-Japan relations. Mr. Shin Donowaki, Vice President of Sumitomo Corporation of Americas for the DC office shared similar sentiments, hoping for Keidanren to help Japanese businesses in the U.S. foster economic growth in both countries. Expectations from the U.S. for the Keidanren’s new office are also strong. In his remarks, Mr. Kurt Tong, Principal Deputy Assistant U.S. Secretary of State, stated that the timing of the reopening was perfect, since it coincided with the TPP free-trade agreement moving forward. He also added that Washington is a competitive market for ideas, and that he hoped Keidanren would be there as an information gatherer and information sharer. Ms. Mireya Solís, Philip Knight Chair in Japan Studies at the Brookings Institution, emphasized that the private sector is key to making trade agreements come alive. She added that she hoped Keidanren’s new office would play a big role in creating a dynamic Japanese economy and in building architecture for Asian Pacific economic integration. We hope Keidanren’s office in DC will make Japanese businesses more present and accessible for U.S. businesses, and believe it will make it possible for everybody to work even closer together. © Copyright 2019 Keidanren USA. All Rights Reserved.